You may have noticed that I have been saying “Week of Christmas Treats” and not “Week of Christmas Cookies“. As much as I love (really. love.) cookies, I can’t ignore the other delicious treats loved by so many this time of year. Fudge is something I’ve ignored for the last few years, but I couldn’t let that crime continue another year. When deciding what kind of fudge I wanted to make I had a lot of ideas swirling around in my head. Once I finally had it narrowed down to 2 ideas, I started searching for good recipes. The problem I came across is that a lot of recipes call for marshmallow fluff or sweetened condensed milk, and some even call for Velveeta cheese (seriously?! tell me it’s better than it sounds). I really wanted to avoid those kinds of products, which, luckily I suppose, really narrowed down my search results. In the end the winning recipe contained evaporated milk (something I usually have on hand anyways) and no marshmallow fluff or sweetened condensed milk (something I never have on hand). 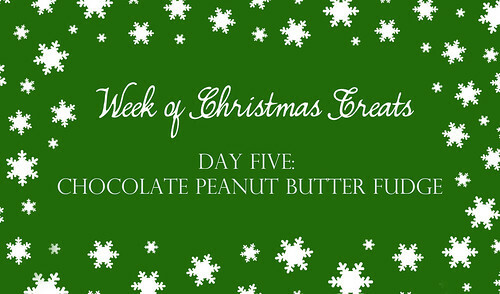 Of course, chocolate and peanut butter are a winning combination in my book. But that’s not all that’s great about this fudge! 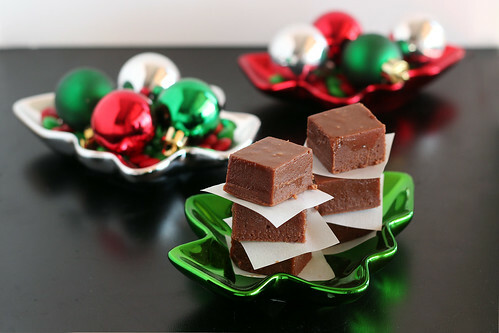 This fudge is also pretty easy to make and the resulting texture is amazing. Smooth and rich without being obnoxiously sweet (which I find some peanut butter fudge to be). The hardest part for me was deciding when to stop beating the fudge after it cooks and sits. I probably could have gone a bit longer, but I wanted to avoid overbeating. Prepare an 8-inch square baking pan by lining with parchment paper (line the bottom and let it over hang the edges, so you can lift the fudge out later) and buttering. In a large saucepan, over medium heat, stir together the granulated sugar, cocoa powder, evaporated milk, and corn syrup until the sugar has dissolved. Once the sugar is dissolved, add 2 tablespoons of butter and stir to melt. Once the butter has melted, bring the mixture to a boil then put a lid on the saucepan and boil for 3 minutes. After 3 minutes, remove the lid and, without stirring, continue to cook until the mixture has reached 234 degrees F on a candy thermometer. Once the mixture has reached 234 degree F, immediately remove from the heat and add the rest of the butter, the peanut butter, and vanilla. DO NOT STIR. Walk away and let it stand for 10 minutes. After 10 minutes, beat the fudge with an electric hand mixer until it loses it’s gloss. I stopped at 8 minutes and probably could have mixed for 1 more minute, but follow your gut, if it’s lost it’s gloss/sheen, stop! Immediately pour the fudge into the prepared pan. Allow to sit at room temperature for about 30 minutes, to cool down, then cover with saran wrap and refrigerate until set. 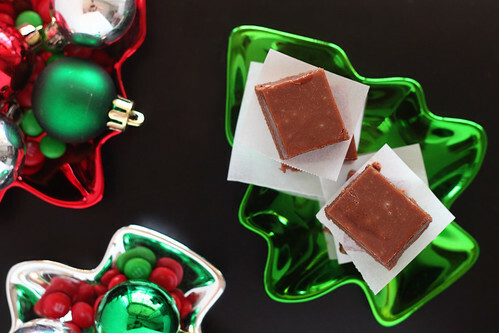 Use the overhanging parchment paper to lift the fudge out of the pan and cut into 1-inch squares. Store in an airtight container in (cool) room temperature.